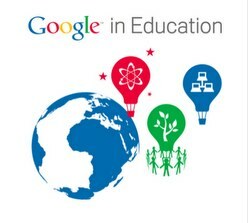 This year my school district finally launched Google Apps for Education for our students to use. We initiated Google Apps last year and began using Google Calendar with teachers and faculty for scheduling purposes. It was a good way for teachers to get experience using Google Apps. Unfortunately, that was the only Google App that we used in my middle school. After recently learning that every student now has a Google Apps account via my school district, I immediately began using Schoogle with my students. Schoogle is what we call our Google in Education account, because it's simply a blend of "School" and "Google" ... thereby adopting the name Schoogle for our school district. Schoogle has honestly changed the way I teach and the way my students learn. I have always valued project-based learning, student-centered learning, and collaboration, but Schoogle takes teaching and learning to a whole new level! I have created a screencast for my students and colleagues in my school district, to demonstrate how to login to our Schoogle account, how to navigate Schoogle, and how to operate Schoogle. IV. Below are just 8 examples of the many different ways in which I am using Schoogle (Google in Education) with my students. Completing Assignments: My students have been creating Google documents, forms, presentations, and spreadsheets for various assignments in my Technology classes. I often require my students to answer reflection questions, provide feedback to assignments, complete surveys and respond to writing prompts. Monitoring Student Progress and Providing Feedback: When my students create a Google Doc, I have them immediately share their document with me, which allows me to (comment) on their document. This also allows me to monitor their progress as they complete their assignments and I can provide constructive feedback to their assignments as they are working. Turning in Assignments: When my students are finished with an assignment, I have them "share" their Google Docs with me. This is system acts like an online Teacher Turn-In Dropbox. As soon my students give me permission to (view) their Google Docs by "sharing" them with me, I can easily view their assignments for assessment. Creating an ePortfolio: I have my students create (collections) or folders in their Schoogle Account to start collecting and saving their projects and assignments for my class. In addition, I also have them upload assignments that they have completed for other classes so that they can start organizing them in their Schoogle Account. This ultimately acts as an ePortfolio that they will be able to use for high school, college and the workplace. Collaborating on Projects: I often have my students work in partners or in groups to complete assignments and projects. Students often assign different tasks to each other, working on different computers while simultaneously editing the same document. I have also created a Google Spreadsheet for groups of students to enter in their data from experiments. I then have my students analyze the collected data to make conclusions, create infographics, etc. Additionally, I encourage my groups of students to work collaboratively on their Google Presentations by having each student responsible for one slide. This allows the each student to contribute to the presentation simultaneously. Collecting Information and Conducting Research: I encourage my students to use online google searches such as Google Advanced Search and Google Scholar to research information. In addition, I also encourage my students to create Google Forms to use as surveys to easily collect information and gather data that they can use for projects and assignments. Scheduling with Google Calendar: I encourage my students to use their Schoogle Calendar as an online interactive agenda to view calendars from their teachers, and to create events to keep themselves organized. They can easily keep track of their assignments, homework, projects and due dates. Empowering my students: I allow my students to use many of the other available Google Apps that they have in their Schoogle Account to create their own projects.